Rev. Dr. Sharlyn DeHaven Gates was installed as the Holly Presbyterian Church’s full-time pastor at an installation service on Sunday, April 10, 2011. Participating in the installation service were: Elder Liz Long, Moderator, Presbytery of Lake Huron; Rev. 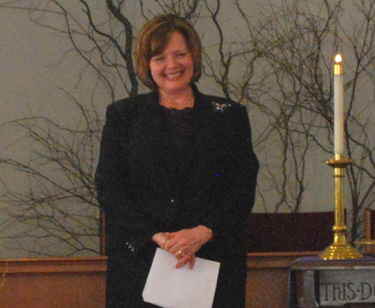 Louise Brokaw, General Presbyter, Presbytery of Lake Huron; Rev. Glenn Grant, Pastor at Kirkridge Presbyterian Church, Grand Blanc; Rev. Dale Swihart, Pastor at Fenton Presbyterian Church, Fenton; Elder Jim Lyles, Clerk of Session, Holly Presbyterian Church; Rev. Dr. Nancy Kahain, Guest Preacher, Interim Executive of the Synod of Mid-America, Acting General Presbyter of the John Calvin Presbytery; Linda Blanchard, Pianist; and Jordan Howe, Special Music, Member of the Holly Presbyterian Church. A reception was held in Fellowship Hall following the installation service.